The SystemDesigner Gain models an amplification of a bus value. The Gain can be any integer greater than 1. The propagation delay can be defined as a fixed time, as asynchronous to any clock, or as a synchronous delay where the delay is a number of SystemDesigner -clocks cycles. 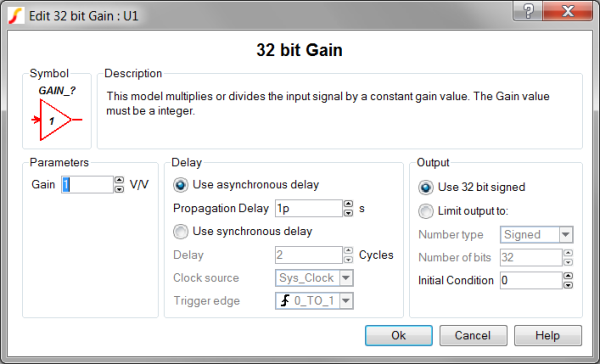 In this release of SystemDesigner , the synchronous delay is supported only for integer-sampled data simulations. Multiple Selections: Only one device at a time can be edited. Gain The gain constant. The gain can be any signed 32 bit integer. Use asynchronous delay Implements a combinatorial model where the output voltage changes in response to the input voltage change after a propagation delay. The propagation delay from an input change to an output change in seconds. This parameter is used only in models with Asynchronous delay. Use synchronous delay In response to an input voltage change, the output voltage changes after a designated number of clock cycles. The propagation delay from an input change to an output change in number of clock cycles. The output will not change until the number of clock cycles has been reached. The output will then change state only on the selected Clock source edges specified by Trigger edge. This parameter is used only in models with Synchronous delay. Specifies the global clock used for the Gain. The Clock can be set up using the SystemDesigner->Edit SystemDesigner Clocks... menu item or by placing a Start of Conversion Breakin. The propagation delay from an input change to an output change in number of clock cycles. The output will not change until the number of clock cycles has been reached. The output will then change state only on the selected Clock source edges specified by Trigger edge . This parameter is used only in models with Synchronous delay.